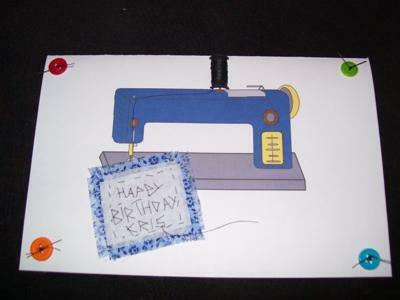 This sew a card project is a beginning project that you can design as a birthday card, note card or even postcard. We've used a zigzag stitch but you can also use a normal straight stitch. 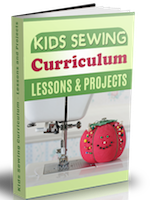 This is a good project for kids who are just learning how to sew corners. Iron your interfacing to the wrong side of your fabric piece. Note: If you are a beginning sewer have an adult help you. 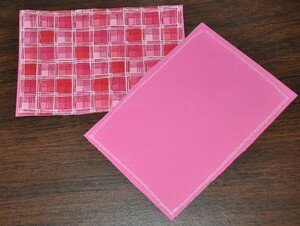 Layer your fabric with the right side down and the cardstock on the top. Carefully hold your layers together while you sew along the edges of your card. Write a special note or send a postcard to someone. You can even use this as a bookmark if you'd like. A fun sew a card idea! I know the best gifts I receive are handmade and when my grandchildren make one for me, it's the best! I send small handmade gifts to family and friends and try to come up with a gift that relates to the person I am giving it to. A friend who loves to sew has a birthday coming up. I love hunting at garage sales and thrift stores...I find so many neat little items there. Recently I found this pretty and unusual pin cushion (new and still in original package) for 99 cents. It was a perfect gift for her! I make my own greeting cards and came up with this idea for her. I knew when the card was completed that it would be adorable if a child made it for someone they knew who liked to sew. 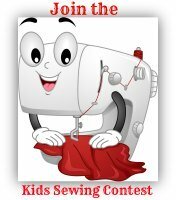 A hand drawn picture of a sewing machine would be a keepsake. I just roughly stitched "Happy Birthday" onto a piece of material and then glued it onto the machine at a position that made it look like the machine stitched it. I cut a small plastic spool in half (the ones that come in travel sewing kits) and wrapped thread around it, then glued it on top of the machine. I also glued buttons on each corner. Inside I wrote the verse, "A day hemmed in prayer seldom unravels" which a child can write in their own handwriting. Just an idea I thought I'd share with other readers. 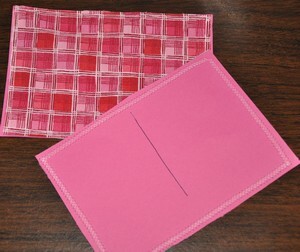 See more beginning sewing projects from this sew a card project.